Melting glaciers spawned rivers on Mars as recently as several hundred million years ago. This image shows a river that sprang from a past glacier from an unnamed crater in Mars’ middle latitudes. Full Story. Water flowedon Mars as recently as several hundred million years ago when sunlight melted athin layer of glacier ice, researchers now say. The evidencelies in dozens of channels on Mars carved by melting glacier water during the cold,dry period that has dominated the red planet for the past 3.5 billion years,researchers said. Such youthful evidence surprised scientists, because itsuggests that runningwater existed on Mars much more recently than previously found. "Wethink of [post-Noachian] Mars as really, really cold and really, really dry, sothe fact that these exist, in those kinds of conditions, is changing how weview the history of water on the planet," said study leader Caleb Fassett,a planetary geologist at Brown University in Providence, RI. A vast oceanon ancient Mars covered more than one-third of the Martian surface morethan 3 billion years ago, according to a study released earlier this month. Butevidence of liquid wateron Mars since the planet's Noachian era, a time period that ended 3.5billion years ago, has remained scarce until now. Fassett andcolleagues at Brown University and Portland State University discovered morerecent evidence in the form of channels that stretch for a mile or two and canhave a width of more than 150 feet (nearly 46 meters). They also linked icedeposits to the channels — called glaciofluvial valleys — carved out by the melt-water. Suchchannels arose on the interior and exterior of Mars cratersin the planet's middle latitudes during the recent Amazonian epoch on Mars,when sunlight melted a thin layer of ice on the top of glaciers. Somegeologists from Brown and Boston University have spotted similar conditions onEarth, too. They occur in the Antarctic Dry Valleys, where glacier surfacesmelt during the summer, they said. "You?refreezing cold and there?s glacial ice everywhere, and it gets just warm enoughthat you get a river," said James Dickson, a research analyst also atBrown University. 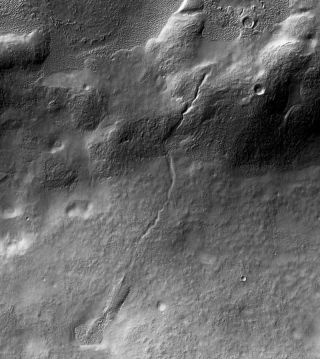 Fassett andhis colleagues surveyed 15,000 images taken by the Context Camera (CTX) aboard NASA'spowerful Mars Reconnaissance Orbiter, which has mapped about 40 percent of theplanet so far. But that's just the beginning of their search for moreglaciofluvial valleys. The researchis detailed in a recent issue of the science journal Icarus.